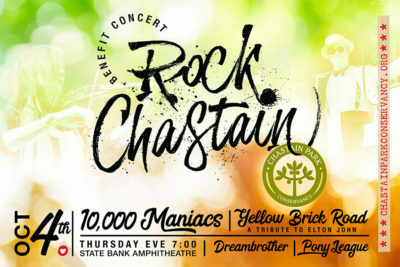 Celebrate with your neighbors at the 5th Annual Rock Chastain Benefit Concert featuring 10,000 Maniacs, Yellow Brick Road-Tribute to Elton John, Dreambrother, and Pony League! The must-see musical event is the perfect way to spend a Fall evening right in your backyard! Pack a picnic, relax among the park’s lush magnolia trees, and enjoy some great music with friends and family. Tickets are available through Ticketmaster beginning at $50 for General Admission with Pit Tables available for $75 per ticket. All funds raised will go to support the mission of the Chastain Park Conservancy to “restore, enhance, maintain and preserve” Chastain Park’s 268 acres and implement the 2008 Atlanta City Council approved Chastain Park Master Plan projects. More information on the 5th Annual Rock Chastain Benefit Concert.